For a list of Dr. Colleen Cicchetti's presentations, publications, and media contributions, please CLICK HERE. Curry, C., Raviv, T., deGury, E., Villaverde, V., Wong, M., & Vona, P. (2018, October). Critical Components of Planning and Practice Toward Creating Trauma-Informed Schools. Symposium presented at the 23rd Annual Conference on Advancing School Mental Health, Las Vegas, NV. Bergen, S., Shalabi, I, & Rivera, C. (2018). Mental Health & Community Stress: Strategies to Promote Resilience for Immigrants and Refugees. Invited Panel Speaker at the Conference of Sanctuary Healthcare for All: Protecting the Rights of Immigrants and Marginalized People, Chicago, IL. Gill, T. (2017). Becoming Trauma Informed: Building Resilience in Communities. Keynote Speaker at the Illinois Department of Public Health, Illinois Women’s Health Conference, Springfield, IL. Kelly, M., Brake, A., Baker, S. & Van Buskirk, J. (2017). Advancing School Mental Health Through Professional Learning Communities: Lessons from Chicago, IL and Ontario, Canada. Workshop presented at the 22nd Annual Conference on Advancing School Mental Health. Washington, D.C.
Kelly, M., Brake, A. & Baker, S. (2016). The School Mental Health Professional Learning Community Project: Developing Leaders & Building Capacity. Workshop presented at the 21st Annual Conference on Advancing School Mental Health. San Diego, CA. Baker, S. & Badie, E. (2016). Setting the Stage for Successful Tier II Groups: Strategies for Referral, Assessment, Engagement and Group Formation. Workshop presented at the Annual Conference for the Illinois Association of School Social Workers. Lisle, IL. Santiago, C.D., Brewer, S.K., Torres, S.A., Papadakis, J.L., Raviv, T., Coyne, C., & Cicchetti, C. (2016). Effectiveness and Acceptability of a School-Based Intervention for Elementary Students Exposed to Trauma. In C.D. Santiago and T. Raviv (Chairs), Implementing School-based Interventions: Promoting Effectiveness, Adoption, and Engagement. Symposium presented at the Association of Behavioral and Cognitive Therapy Annual Meeting, New York, NY. Raviv, T. (discussant, 2015). Intervening with Elementary School Children Exposed to Trauma: Effectiveness of a School-based Intervention and Recommendations for Implementation. Symposium presented at the International Society for Traumatic Stress Studies 31st Annual Meeting, New Orleans, LA. Raviv, T., Wadsworth, M.E., & Reinhard, C. (2004). Coping with Economic Strain in African American, European American, and Hispanic Adolescents. Paper presented at the biennial meeting of the Society for Research on Adolescence, Baltimore, Maryland. Raviv, T., Gudmundsen, G., McIntosh, D., & Wadsworth, M.E. (2003). Coping with terrorism: A developmental comparison of parents, young adolescents, and young adults. Paper presented at the biennial meeting of the Society for Research in Child Development, Tampa, Florida. Baker, S. & Gill, T. (2017). Impact of Exposure to Trauma on Students, Staff & the School Community. Workshop presented at the Training Institute for School Social Work Professionals, Jane Addams College of Social Work, University of Illinois at Chicago. Chicago, IL. Gill, T. (2017). Compassion Fatigue & Self-Care Strategies for Educators Working with Trauma-Exposed Youth. Southland Partnership for Resilience: Professional Learning Community Presentation, Governors State University, University Park, IL. Baker, S. (2017). Impact of Trauma on Youth & Families: Building Trauma-Sensitive Practices. Guest lecture in Social Work & Healthcare course at School of Social Service (SSA), University of Chicago. Chicago, IL. Raviv, T. (2016). Trauma-Informed Strategies for Child Welfare Workers. Presented at ChildServ, In-service, Park Ridge, IL. Cicchetti, C., Raviv, T. & Ford-Paz, R. (2015). Supporting Implementation of Evidence-Based Mental Health Interventions in Community Settings. Virginia Tarlow, M.D. Grand Rounds, Department of Psychiatry and Behavioral Sciences, Northwestern Feinberg School of Medicine, Chicago, IL. Dunlap, S. & Raviv, T. (2015). Building Trauma-Sensitive Schools through School-Community Collaboration. Workshop presented at the Urban Youth Trauma Center 5th Annual YOUTH-CAN Conference, Chicago, IL. Cicchetti, C. & Raviv, T. (2015). Creating Trauma-Informed Communities and Schools in Chicago and Illinois. Panel presentation at the CBITS Summit, Los Angeles, CA. Raviv, T. (2014). The Impact of Trauma on Young Students, Staff, and the School Community. Workshop presented at Ready, Set, Teach Summer Institute for Early Childhood Educators, Chicago Public Schools, Chicago, IL. Raviv, T. (2012). “What did you learn in school today?” Partnering with schools to provide access to trauma-based treatment. In K. Underwood (Chair), Collaborative models in Illinois for school-aged children: Engaging families in trauma treatment. 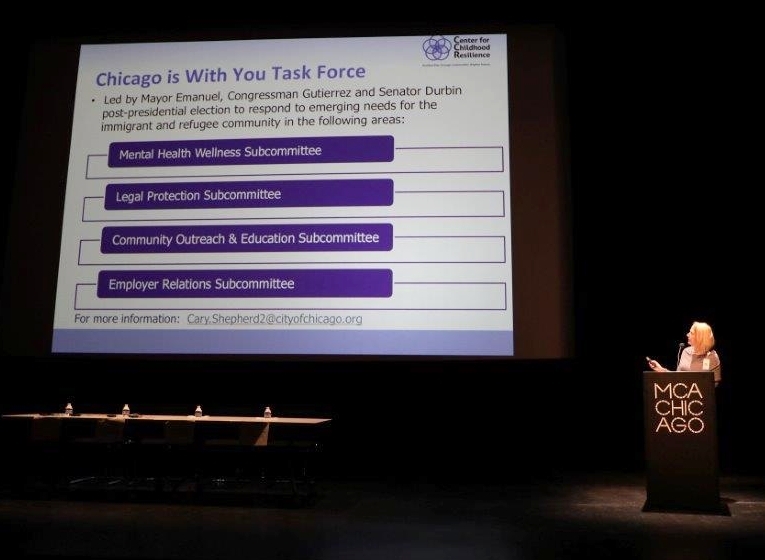 Panel conducted at the Symposium on Child Trauma in the Public Sector, Chicago, Illinois. Walter, Heather; Gouze, K.R. ; & Cicchetti, C. with Blair, A; Fagen, P. , Mehta, T., & Schmidt, J. (2007). Mental health in schools project. Invited Address, Warren Wright Guest Lecture Series, Children’s Memorial Hospital and Northwestern University Medical School, Chicago, IL.